I'm here to summon spring to come as quickly as possible. The cherry trees around my neighborhood should have been blooming outrageously by now. But those pinkish fairies still haven't shown up yet. I am hoping that through cooking, I can make it look like spring is here. 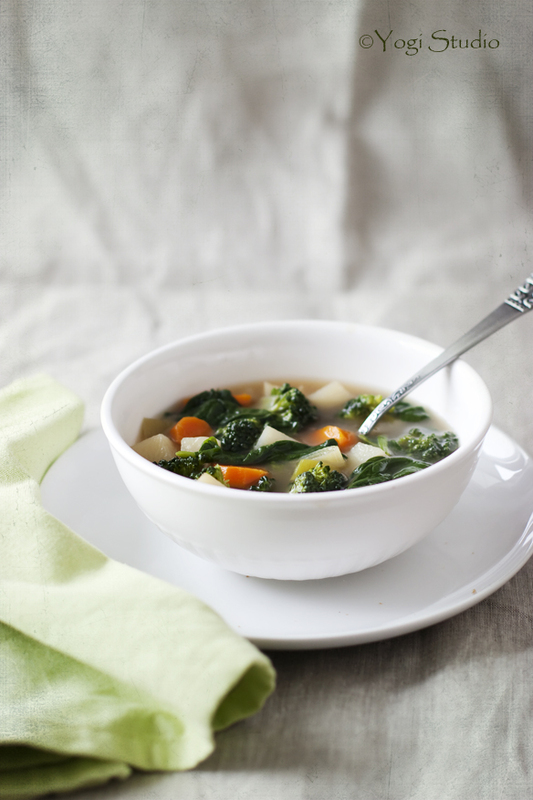 This vegetable soup is delightful and refreshing. By taking a further step in making the broth first with some basic ingredients and herbs and then straining the broth, the sweetness of the vegetables infiltrate the broth thoroughly without the mushy vegetables messing up the clearness of the soup. After making the broth, you can freeze it for later use. 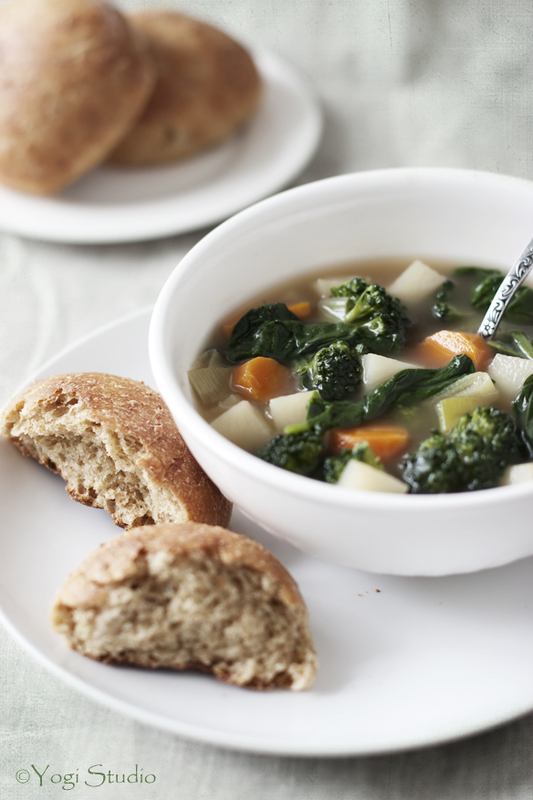 The time taking to make the soup is short, depending on the vegetables you use. Heat olive oil in stock pot over medium heat. Add carrot, celery, onions, leek and garlic. Cover and cook vegetables, stir occasionally, until veggies are softened, about 5 to 7 mins. Add broth and water, black peppercorns, bay leaf, thyme and parsley. Turn up the heat and bring it to a boil and turn it back down to simmer. Simmer until the broth is flavorful, about 20 to 30 mins. 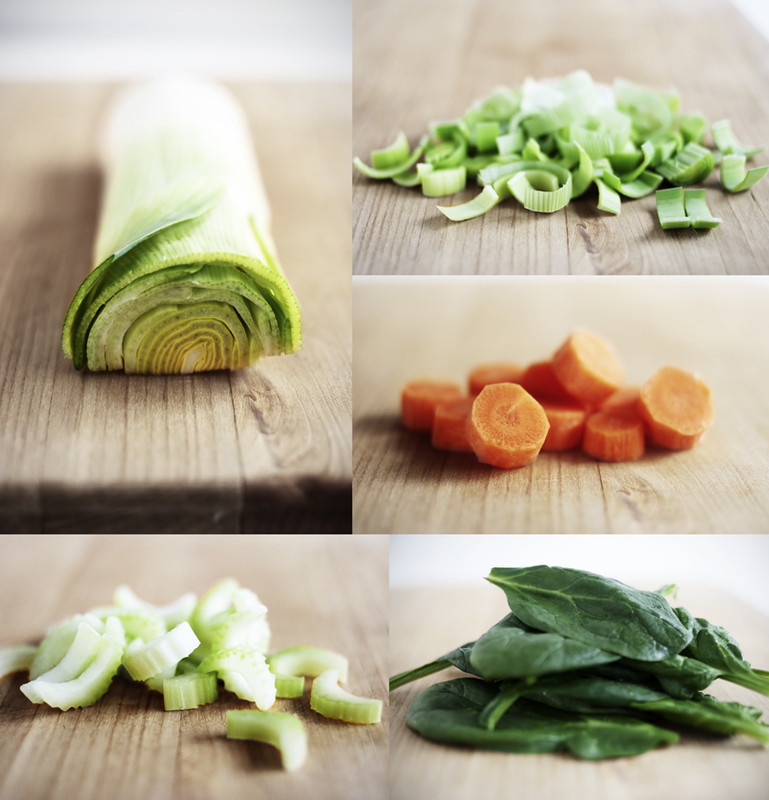 Strain the broth, squeeze out juice from veggies and then discard the veggies. Bring broth to simmer over medium heat. Add celery, carrots, leeks, potatoes. Simmer for 6 mins. Add broccoli, simmer for another 3 mins or until potatoes and carrots are tender. Stir in spinach. Season with salt and pepper and serve. The original recipe asks for store-bought chicken broth and 7 cups of the broth without water. Since I was using home-made broth and I didn't like the chicken flavor to be too strong, I diluted it with water. You can try cooking with other ingredients. Such as putting some diced tomatoes in and replacing potatoes with mini pasta; adding green peas in is also a very nice touch. 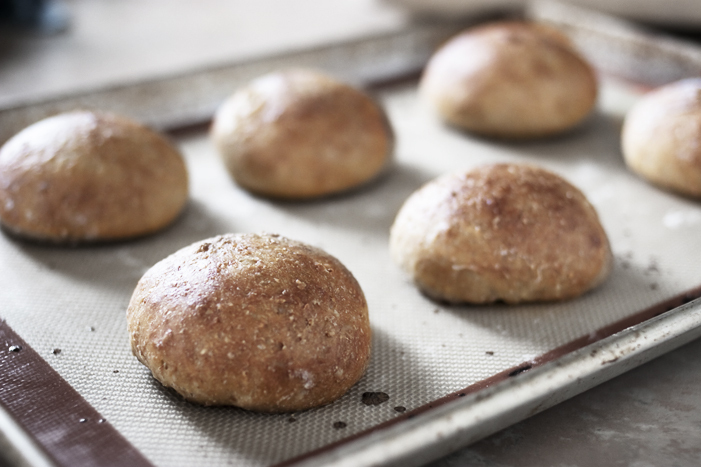 These whole wheat buns are soft and light in texture. The original recipe is to make a loaf with raisin mixed in the dough and sugar sprinkle on top. The instruction below is simplified. If you are familiar with the no knead method of Jeff Hertzberg and Zoe Francois, same steps are taken in this recipe. If you are not, please refer to my post on Light Whole Wheat Bread or their book for further details. Mix all the dry ingredients together in the standing mixer with a dough hook attachment. Whisk the wet ingredients together. Pour the wet ingredients into the dry ingredients all at once. Stir all ingredients together in the mixer until all combined. No kneading is necessary. Put the dough into a 5 quart plastic container. Cover with the lid ajar. Let it rest for 2 hours. Close the lid (not air tight) and put in the fridge. Dough can be used over the next 10 days. On baking day, cut up the dough and quickly shape it into ball shape with a wet hand. Each ball should be a size of a small orange. Put the dough on the baking sheet lied with parchment or silpat. Let the dough rest for an hour. 30 mins before baking time, preheat oven to 375F. Position tray into middle of the oven. Just before baking, brush to top of the dough with milk. Bake the dough for 25 mins, or until internal temperature reaches 200 - 210F. Cool the buns before serving. I hope your summoning works! Both of these recipes sound wonderful. 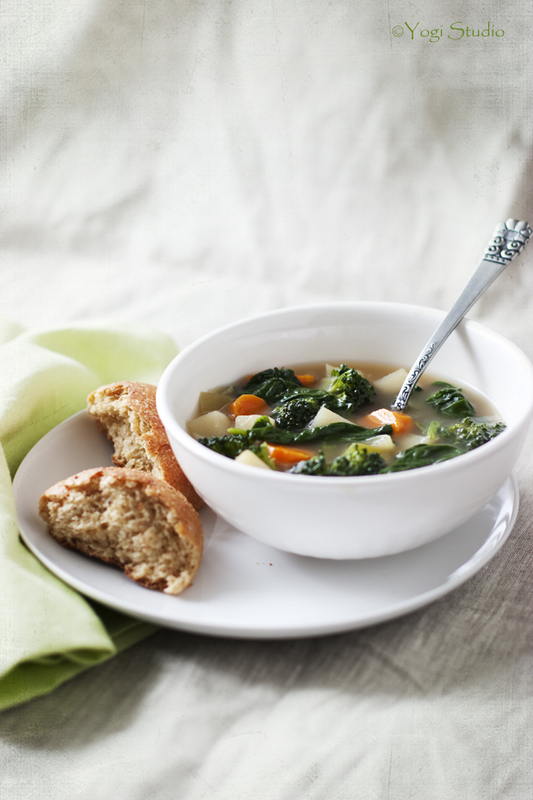 I love spinach in soup! @Kaitlin - I think it is working! We have nice weather today...sunny without rain!! @Mervi, Tomato Branch - You can use store bought vegetable broth or even just water to replace the chicken broth. Let me know how it turns out! these photos are so gorgeous. @hannah queen - Thank you!! Hello! I just discovered this blog and love it! I have very similar tastes to you in food, as well as being a professional photographer. I was wondering, first, what camera you are using, the pictures are fabulous! And also, I am working on starting a blog of my own, and wondered what template you used, as it is easy to use and navigate around with all the pictures. Thanks so much and keep up the good work! Olivia Joy - Thank you for visiting my blog and welcome to the blogosphere. I'm in no way a pro. I can just call myself a part-time enthuastic amateur photographer. There are so much to learn and explore in photography. I've been using a Canon 20D for quite a while but I will be using a new camera for my food pics in the next post. I used the most simple and basic minima template and modified the html code a bit. It could be better if I've got more time! Good luck with your new blog!